While the battle for control of the U.S. Senate has understandably taken a back seat to the strange, winding road of this year’s presidential contest, the 2016 cycle is nonetheless poised to see many competitive contests down the ballot in races for the nation’s upper legislative chamber. Elections in Florida, Indiana, Missouri, Nevada, New Hampshire, North Carolina, and Pennsylvania in particular might not be called until late in the evening – or not on election night at all – with a chance that one of these races might end up being the closest U.S. Senate contest in their respective state’s history. So how competitive would each have to be to set a new state record? For this study, Smart Politics reviewed the more than 1,700 direct elections that have been conducted for the U.S. Senate to determine the most closely decided contests in each of the 50 states. Most states have hosted at least one extremely competitive U.S. Senate election over the last century, with 37 states seeing at least one of its races decided by less than one percentage point. The most narrowly decided races in seven of these states ended up with victory margins tallying less than one-tenth of a percentage point. New Hampshire, 1974 (0.00 points): Republican Louis Wyman over Democrat John Durkin. This election was famously ‘decided’ by just two votes (in favor of Wyman, according to the Republican ballot commission) and then 10 votes (in favor of Durkin, according to the Secretary of State) out of more than 223K votes cast. Democrats could not overcome a GOP filibuster to seat Durkin, however, and a new election was held more than 10 months later in September 1975 with Durkin victorious by 10.6 points. Minnesota, 2008 (0.01 points): DFLer Al Franken defeated one-term Republican U.S. Senator Norm Coleman after a protracted recount and lawsuit. Franken was eventually seated in July 2009 with a 225-vote victory out of nearly 2.9 million votes cast. Nevada, 1964 (0.04 points): One-term Democratic U.S. Senator Howard Cannon edged Republican Lieutenant Governor Paul Laxalt by 48 votes out of more than 134K votes. Delaware, 1922 special (0.08 points): Democratic attorney Thomas Bayard defeated appointed U.S. Senator T. Coleman DuPont by 60 votes out of 74K+ votes cast. Bayard also simultaneously defeated DuPont by 0.43 points in the election to the seat for the unexpired six-year term. Iowa, 1924 (0.08 points): One-term Republican U.S. Senator Smith Brookhart edged Democratic attorney Daniel Steck by 755 votes out of 896K+ votes cast. However, Steck later successfully contested the election and was seated in April 1926. North Dakota, 1974 (0.08 points): Five-term Republican U.S. Senator Milton Young defeated former Democratic Governor William Guy by 177 votes out of 237K cast. Washington, 2000 (0.09 points): Former Democratic Congresswoman Maria Cantwell beat Republican U.S. Senator Slade Gorton by 2,229 votes out of 2.4+ million votes. Of the remaining 13 states, the closest U.S. Senate race in five states resulted in victory margins of more than two points with Arkansas’ the largest in the nation at 5.4 points (Republican Tim Hutchinson over Democrat Winston Bryant in 1996). Hawaii (1959, 2.80 points), Tennessee (2006, 2.72 points), South Carolina (1966, 2.70 points), and Nebraska (2000, 2.18 points) round out the bottom five. The last two state records to fall for the most competitive U.S. Senate elections came in the 2008 cycle with voters in Alaska and the aforementioned race in Minnesota between Franken and Coleman treated to historically close races. In Alaska, Democrat Mark Begich defeated seven-term Republican U.S. 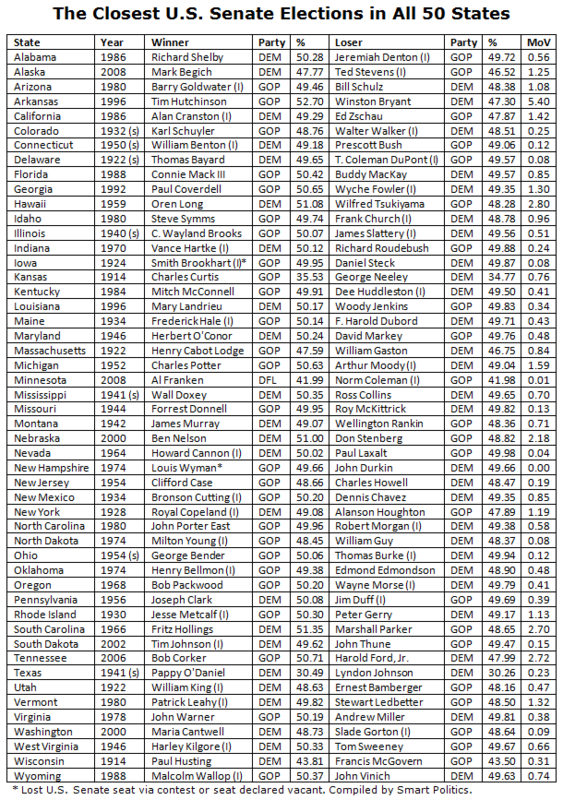 Senator Ted Stevens by 1.25 points besting a Last Frontier State mark set four years earlier when GOP U.S. Senator Lisa Murkowski beat former Governor Tony Knowles by 3.03 points in 2004. In Minnesota, Franken’s 0.01-point win over Coleman ended an 84-year record dating back to the Election of 1924 when Republican Congressman Thomas Schall unseated Farmer-Laborite U.S. Senator Magnus Johnson by a 0.95-point margin. Another state record could very well fall in 2016 as the nation has never gone six years – let alone eight – without at least one state breaking its mark for the closest ever U.S. Senate contest. Other state records set during the 21st Century came in Nebraska in 2000 (Democrat Ben Nelson by 2.18 points over Don Stenberg), Washington in 2000 (the previously discussed race between Cantwell and Gorton), South Dakota in 2002 (Democratic U.S. Senator Tim Johnson by 0.15 points over Republican U.S. Representative John Thune) and Tennessee in 2006 (Republican Bob Corker by 2.72 points over Democratic Congressman Harold Ford, Jr.). Two states have not seen their records fall since the inaugural cycle in 1914 requiring direct elections after the passage of the 17th Amendment: Kansas (former Republican U.S. Senator Charles Curtis by 0.76 points over Democratic Congressman George Neeley) and Wisconsin (former Democratic state legislator Paul Husting by 0.31 points over Governor Francis McGovern). Records in five other states have stood since the 1920s: Massachusetts (1922), Utah (1922), Delaware (1922), Iowa (1924), and New York (1928). It should come as no surprise that North Carolina’s 2016 race between Senator Richard Burr and Democratic challenger Deborah Ross is poised to be one of the most closely decided this cycle. The Tar Heel State has hosted the most competitive races for the U.S. Senate over the last quarter-century, with an average margin of victory of just 6.1 points across its nine elections to the chamber conducted since 1990. Two other must-watch states next Tuesday – Missouri and Pennsylvania – are tied for the fourth most competitive during this quarter-century span, with U.S. Senate elections decided by an average of 9.9 points. 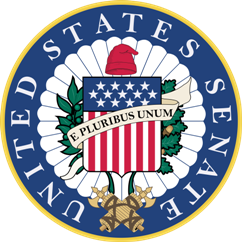 During the last two election cycles, nine of 71 U.S. Senate races were decided by less than five points but only two decided by less than one point: North Dakota in 2012 (Democrat Heidi Heitkamp by 0.92 points over Republican Congressman Rick Berg) and Virginia in 2014 (Senator Mark Warner by 0.81 points over GOPer Ed Gillespie). 2 Comments on "The Closest US Senate Races in All 50 States"
2. For all his polarising presence and posturing in his day, NONE of the 5 elections involving Jesse Alexander Helms ended up making a state nailbiter record. 3. Three contests seem to be prime (“must-watch”) contenders for their respective record-setting nail-biters, namely NC, MO, and IN. While at least 2 of these are very likely to vote for the trumPence ticket (particularly in the wake of the 11th-hour James Comey declaration on the 28th) all have a sizable bloc of ancestral Ds who are less averse to sticking with their historic preference down-ballot. Too, each also has a lively gubernatorial contest, further augmenting statewide competition. Even more so, for all his polarizing presence, Jesse Helms kept getting re-elected while it was the *other* seat that switched hands and parties every single time after Sam Ervin retired. Robert Morgan lost to John East, John East died and his appointed replacement, James Broyhill, lost the special election to Terry Sanford, who did win election to a full term but then lost to Lauch Faircloth, who lost to John Edwards, who retired as was succeeded by Richard Burr.